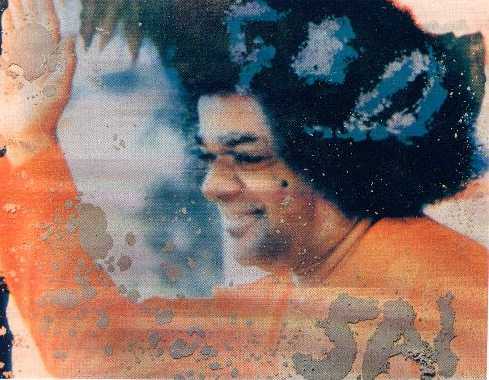 Vibhuthi (holy ash) was manifested on this Baba's photograph spelling the word "God" in London, UK, later vibhuthi manifested on Baba's hand and spread downwards to form the word "SAI". This photograph was taken at a Sai Bajan session in Paris. 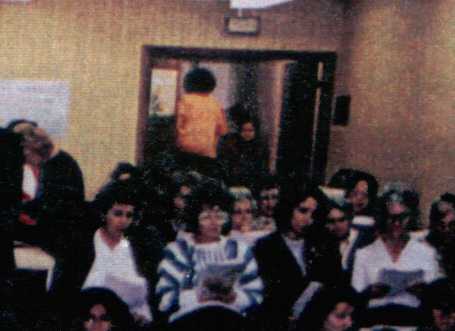 When the photograph was developed this image of Sai Baba leaving the hall was seen on the photograph. Sri Satya Sai Baba raised Mr V Radhakrisna from the dead in 1953 after he had had been dead for about two days. He went Puttaparthi with his wife, daughter Vijaya and his son in law Mr K S Hemchand. He was suffering from gastric ulcers, was very ill at the time of the visit and this was one of the reasons for visiting the ashram. He was given a room in the same building the swami lived and spent most of his time in bed and was visited by Baba before he went to a coma and died. On the third day after his death when the corpse was stinking Baba came to his room and asked his wife, daughter and son in law to wait outside and closed the door. After few minutes he opened the door and on the bed Mr Radhakrisna was looking up at them and smiling. Baba asked the wife to give him a hot drink and waited for another half and hour in the room. Family stayed at Prashanthi Nilayam for few more days and returned to their home in Kuppam. His gastric ulcers had vanished for ever and he continued to live for many more years afterwards.